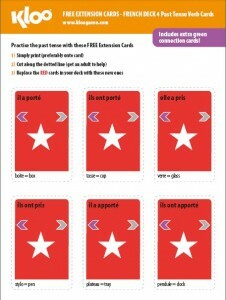 These cards are for those learning French and want to practice future and past tenses. KLOO decks are mathematically balanced so please follow the instructions carefully below. These cards will work with your existing decks (see below). However they are most suited for the most recent versions of KLOO. In the download sheets you will find extra red verb cards and extra green connection cards. Note that Deck 4 introduces more pronouns to practice too (he, she and they). PRINT – you can print directly onto card, or thick paper (or normal copier paper and stick onto card). CUT OUT – Cut out the cards. There are markers around the cards so they are the exact size. REPLACE – KLOO decks are mathematically balanced so you need to replace the present tense verb cards in your decks with these new verb cards. NB Although, these cards have been designed to work with the latest (2014) Race to Paris version – they will also work reasonably well with earlier versions of card and board games.